Starting in 2005, within five years a Nebraska school chopped the obesity rate of its grade school students by a stunning 13 percent. How did they do it? Click here for original Gazette pages with al photos and charts. CHARLESTON, W.Va. — In 2005, almost four out of 10 kids in the Kearney, Neb., schools were obese or overweight. “It was time to do something about it,” said Cari Franzen, Kearney Schools wellness coordinator. Five years later, Kearney had chopped the obesity rate of their grade school kids by a stunning 13 percent. Eighty six kids dropped from obese or overweight to normal. No other school system has done that, said Ginny Ehrlich, CEO of the Alliance for a Healthier Generation. “What Kearney has done is unique and a great example for the rest of the country,” she said. Two Kearney grade schools pulled off especially dramatic drops. Low-income Emerson Elementary started with 44.8 percent of students obese or overweight and ended with 35.2 percent. A second school dropped from 36.5 percent to 26.4 percent, a 27.7 percent drop. Mary Weikle’s eyes widened when she heard the Kearney numbers. “How’d they do that?” she said. “We basically rethought the school day to find ways to get the kids moving,” Franzen said. First, they applied for and got a $900,000 federal Physical Education Program grant. But $900,000 is not a lot of money to change a school system, especially divided into three years. They adopted a new physical education program, Spark, that promotes lifelong fitness and enjoyment of exercise, rather than athletic competition. “It gives you a research-based roadmap, with activities and tips,” Franzen said. They trained their P.E. teachers to use it. They scheduled physical education class every other day and had physical activity sessions on the non-P.E. days. 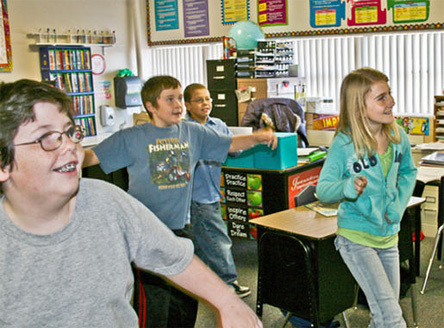 They wove short bursts of physical activity through the classroom day, using the “Take Ten” program that shows teachers how to connect physical movement to subject areas. 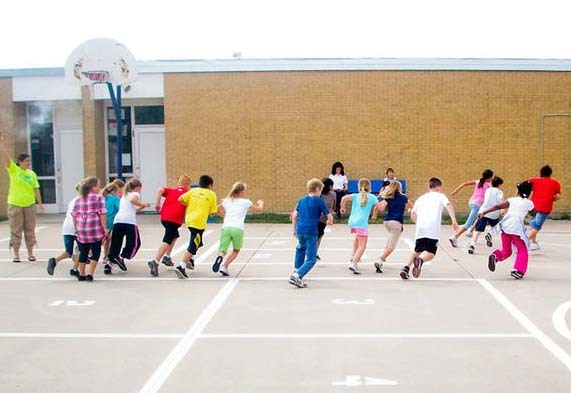 Some schools used the free “Jammin Minutes” program that provides ideas for quick minutes of physical activity. They structured their recesses. Instead of standing around the playground, all students now play group physical activity games. “The kids really enjoy that,” Franzen said. Some grade schools run or walk laps at lunch, she said. They started a middle-school Fitness, Fun and Games class, focused on activities children could do all their lives. They bought each school inexpensive play equipment such as jump ropes, balls, rubber fitness station mats, scooter boards, as well as video exercise DVDs. They revamped their food service to reduce processed food. They involved the community, including family fun nights. Two grade schools that increased their BMI started late, Franzen said. The other seven schools lowered their BMI. The grant is running out, but the program does not depend on it, she said. “We planned it to be sustainable.” Otherwise, she said, the system could gain the weight back, like a person who goes off a diet. Eighty six children dropped from the obese or overweight category to healthy weight. “They are growing in height, so of course, they gained weight,” Franzen said. “But — and this is an important point — they didn’t gain as much. They gained five pounds instead of 15. Could W.Va. counties do it? To get those results, West Virginia kids would need equivalent physical activity time, Mary Weikle said. “You have to have 20 consecutive minutes to get cardiovascular benefit,” she said. “We’re not there. You’ve got to intentionally have that time,” she said, whether it’s in physical education class or less formal physical activity sessions. Junk food is banned from school vending machines. Soda pop sales are outlawed in 54 of 55 school systems, Wyoming County being the only exception. West Virginia has started to get processed food out of school meals with a six-county pilot project. Like Kearney, West Virginia braved the cupcake moms and replaced cupcakes at school parties with salsa and healthy snacks. Kearney kids face many challenges that West Virginia kids face. More than 60 percent qualify for free and reduced-price school lunch, compared with West Virginia’s 52 percent. Kearney’s per capita income is $23,071, compared with West Virginia’s $16,477. In 2007, 63 percent of Kearney kids spent between one and three hours a day surfing the net and texting. Thirty-one percent of West Virginia kids watch three or more hours of television a day, not including the Web and texting. Thirty-six percent of Kearney children were obese or overweight in 2006. Today, 47 percent of West Virginia fifth-graders are in the same boat, 29 percent obese and another 18 percent overweight. Seventy-five percent of Kearney students did not eat green salad more than three times a week. Eighty percent of West Virginia kids say they do not eat five servings of fruits and vegetables a day. In 2005, 62 percent of the Kearney kids had zero phys ed per week. In 2009, 67 percent of West Virginia high school students had no PE in an average week. Nebraska legislators worry about the rising cost of health care, as do West Virginia legislators. Can W.Va. change the future? Can a whole state like West Virginia lower its future heart disease and diabetes rates by getting kids more active? There are 772 West Virginia public schools, with 283,000 students. State Superintendent Jorea Marple is signaling local schools that more physical activity is expected, but it is not policy, so far. The local level is where it happens, said Ginny Ehrlich of the Alliance for a Healthier Generation. The Alliance, sponsored by the American Heart Association, works with 14,000 schools nationwide to promote physical activity, including more than 130 West Virginia schools. It will be clear that the state is serious when they put measures of physical fitness in places that count, she said. At this point, there is no measure of fitness on West Virginia’s state, county or school report cards that determine whether school systems get accredited. Meanwhile, in Kearney, Neb., grant funds are running out. Franzen is scheduled to be laid off at the end of this school year. Kearney Schools have been bombarded with requests for information. They expect to release a detailed report this spring. This entry was posted in Diabetes, Obesity/ chronic disease, Physical Activity resources, School efforts to lower the numbers, Stories about community programs, Stories that illustrate research. Bookmark the permalink.